Saturday, Sunday, April 20, 21, Easter weekend. Saturday, Sunday, Monday May 25, 26, 27 Memorial Day weekend. Saturday August 31 and Sunday, Monday September 1, 2 Labor Day weekend. Thursday, Friday, Saturday, November 28, 29, 30 & Sunday, December 1 Thanksgiving Day weekend. In March 2016 GSMC member Loretta Dunham was researching old newspapers at the Monroe Museum and came upon a small notation from the Monroe Democrat on December 14, 1899 of the funeral of Miss Ellen Whitney and that the body was interred at the Potter Cemetery. Loretta contacted me, I contacted Patricia Gee of the Dearborn Historical Society as Miss Whitney had died at St. Joseph's Retreat in Dearborn. Patricia sent me materials she found in records of Dearborn funeral director Louis Howe and I researched on RootsWeb and put together a small file about Miss Whitney. Fast forward to late 2017 when Loretta was helping Friends of Potter Cemetery update our information on Find A Grave and make a spreadsheet of the Potter Cemetery burials. We knew very little about Ellen Whitney so Loretta & I (mostly Loretta) set out to learn more about her. Turns out Ellen was the daughter of Chandler and Elizabeth (Durand) Whitney and was born in Orwell, OH in 1850. She had 3 siblings, Gillespie B. Whitney who died at age 3-4, Lee D. Whitney and Rev. Gillespie H. Whitney. We now have information on all of them, including census, death certificates, obituaries, etc., where they are buried and pictures of markers (if they have markers). Loretta and her husband Jim even made a special trip in April 2018 to Orwell, OH to find and photograph the grave site of young Gillespie B. Whitney. We believe the father Chandler is buried there too, unfortunately without a marker. Ellen had been a school teacher around northern, MI, including Sault Ste. Marie. Apparently shortly before her death Ellen became violently insane and was taken to St. Joseph's Retreat where she passed. 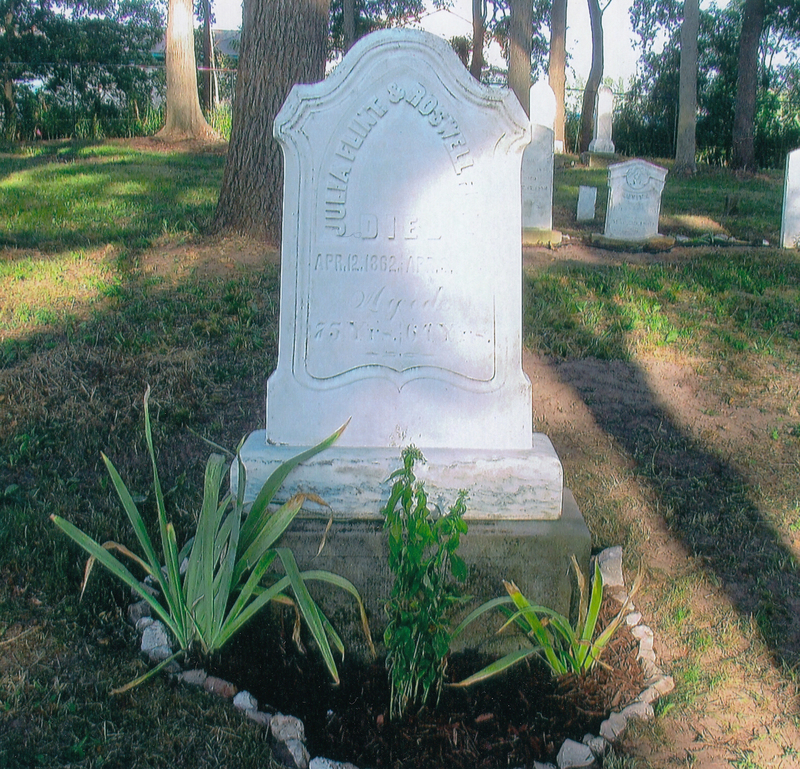 Her body was taken by train to Newport, MI where it was retrieved by her brother Lee's wife Jesse and Miss Whitney was buried at Potter Cemetery in Ash Township. This was all news to me; we have never seen a marker for her at Potter. However there is a slotted base so we will be probing and carefully searching around it in the hopes of finding a marker for Ellen. 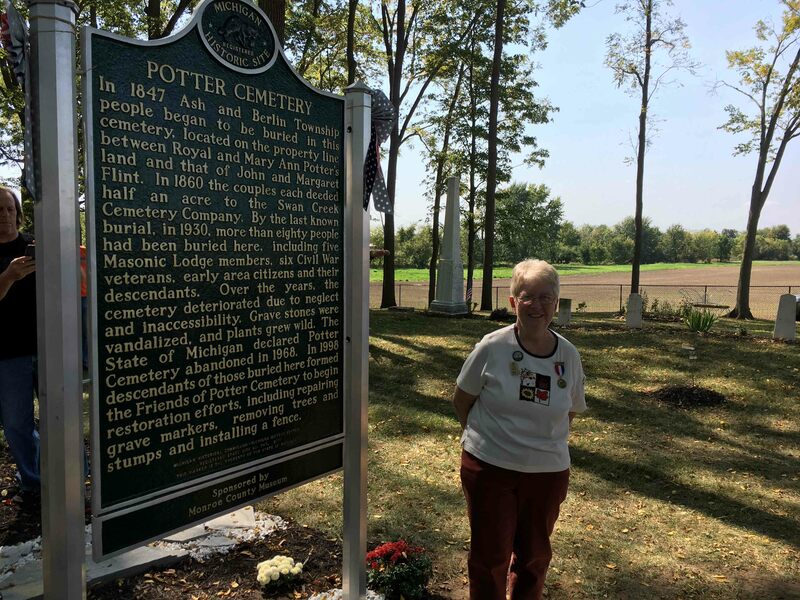 Potter Cemetery recently celebrated its rededication!! Congratulations to Sue Donovan and the other trustees for their work in getting a historical marker in the cemetery. 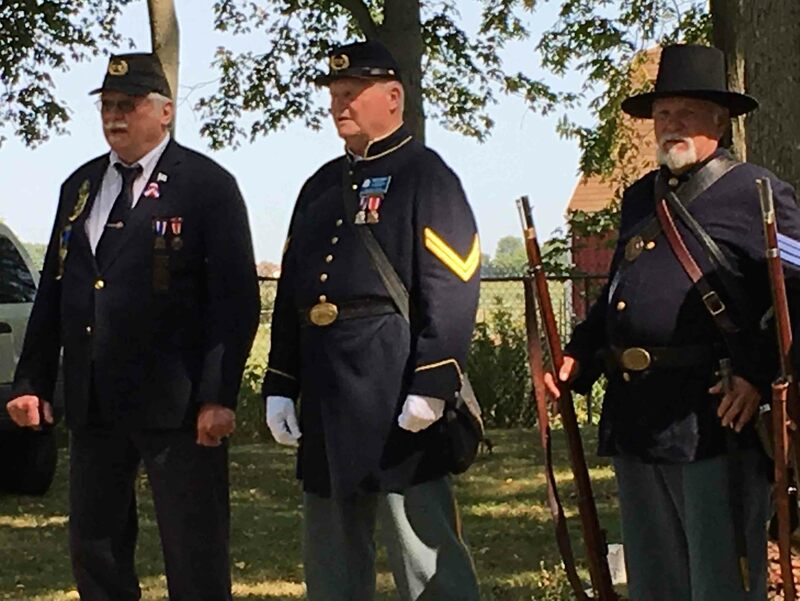 Sue and her team planned and executed a great event on Sunday, September 17th with music, raising of the flag and a 21 gun salute (and musket salute too). All of the stones have been restored and are absolutely beautiful thanks to the efforts of Dave Carter and his team. Thanks to the Andy Clark from the Monroe County Historical Museum and Bill Saul for shuttling attendees to the event. It is a LONG walk otherwise. 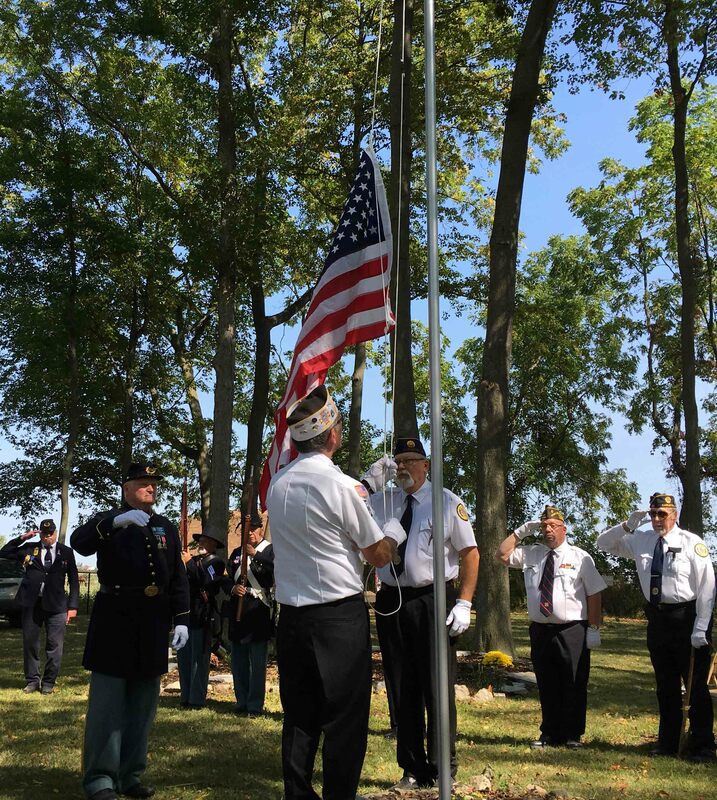 Thanks to Andy & Phyllis Vanderbush, the Carleton VFW, Rick Danes, Carleton American Legion, Brian Egen, the Dodsworth Duo, Senator Dale Zorn and to all that attended to make such a memorable day. 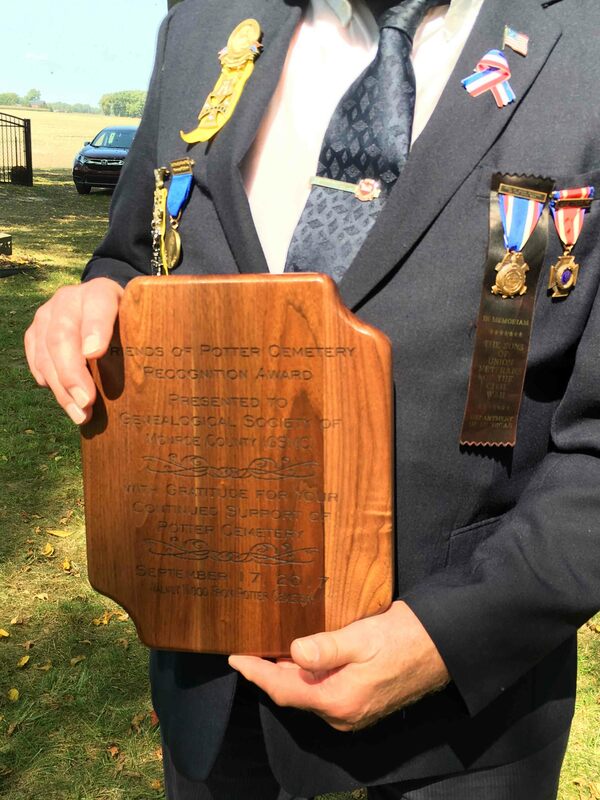 Plaques made from walnut from trees felled in the cemetery were presented to individuals and groups who helped make the restoration of Potter Cemetery possible. Our president, Mike Van Wasshnova accepted the award for GSMC. See photo to right. The best part of the day was when Sue Donovan was given her plaque, she received a standing ovation! Well done and much deserved, Sue!! Potter Cemetery continues to grow with five new members thus far for 2017. There is now a lifetime membership option of $100.00 (each person) available in addition to the usual $10.00 annual membership. We would love to have you join us whatever you choose. If you have been a member before and would like to rejoin we would love to have you back and the dues are the same. Checks can be made out to Friends of Potter Cemetery and sent to me, Sue Donovan at 30066 Marr, Gibraltar, MI 48173 There is no application to fill out. Call 734-675-5162 or e-mail for more information. Several markers have been cleaned, repaired, and put upright. See below for a great example! Julia & Roswell Flint's marker- as found when the Potter group was able to get into the cemetery (on left) and again once the group was able to do their magic! This stone was adopted by GSMC in Florence Wilson's memory. Thanks to Sue Donovan for an updated photo (Sep 2015). Check here for the latest happenings with Potter Cemetery! A Melting Pot of Family Recipes, a cookbook to benefit Friends of Potter Cemetery, is now available!! It is soft cover, has 325 recipes, cooking hints, index, etc. and costs $11.00, shipping is an extra $4.00. This was done by a committee of 4, with recipes contributed by members, friends, relatives, and co-workers. Proceeds will benefit the restoration, maintenance, and preservation of the historic Potter Cemetery. Checks can be made out to Friends of Potter Cemetery Association and sent to Sue Donovan at 30066 Marr, Gibraltar, MI 48173. Or pick one up at the Monroe County Historical Museum, 126 S. Monroe Street, Monroe, MI. Gov. 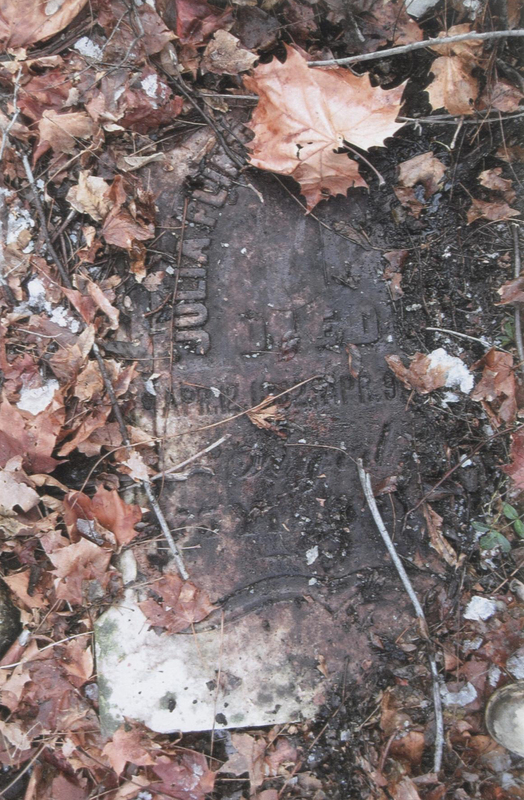 Snyder signed HB 5404 to prevent landlocking of cemeteries in MI on Dec. 31 at 5:26 pm. It has been filed with the Secretary of State and is now PA (Public Act) 525 of 2012 with immediate effect. Many thanks to Rep. Dale Zorn, his staff, including John Manor, Sen. Richardville and all the legislators. And to former, and now deceased Rep. Kate Ebli, who first took on this cause with us. The votes in both houses were unanimous and now it is law! There is now gravel on the path into the cemetery, making entry much easier!